with more than 90 teachers. 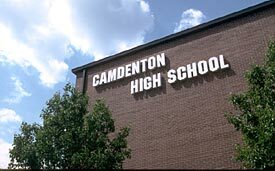 Camdenton R-III schools place a high value on quality education. Striving to provide that education in the face of unprecedented growth in student population presents a great challenge. The district offers modern facilities and dedicated teachers. Strong extra-curricular programs in athletics, art, music, and special programs for gifted and talented students, and those with learning disabilities, allow each student to reach his or her full potential. Some of the programs available to students include drama, FFA, FHA, FBLA, industrial technology, band, chorus, and vocational agriculture. Athletic programs encompass football, volleyball, softball, basketball, wrestling, track, baseball, golf, and weight training. Home of the Lakers 4A High School Football State Champions! Four elementary schools serve more than 2,000 students, with nearly 150 teachers. The Middle School has more than 600 students and nearly 50 certified staff members. High school and vocational technical programs serve more than 1,100 students with more than 90 teachers. The school district covers 334 square miles in three counties (Camden, Morgan, and Laclede). Four incorporated cities are within the 213,760 acre district. Everyone connected with R-III Schools believes all students can learn and need to be willing learners. While all students are unique with varying learning styles, abilities, strengths, and interests, and should be offered opportunities to maximize their capabilities, students are responsible for personal decisions, actions, and behaviors with appropriate consequences. Learning is enhanced through social interaction, and all students are encouraged to develop their talents in school and other community activities. Teachers facilitate learning and problem solving rather than just providing information. Students, teachers, parents, and staff are all accountable for the success, support, and nurturing of students for optimum development. District students have access to the latest technology, with an average of one computer for every six students and more than 600 Internet-capable computers in the district. For more information, you may call the Upper School at 573-346-0590 or the R-III Schools at 573-346-5651. Bus Barn S may be reached by calling 573-346-7269. The Lake Career and Technical Center provides a complete guidance and counseling service to assist students in making important decisions about educational, vocational, and personal matters. The vocational counselor and classroom instructors assist students in securing employment after successful completion of training programs, as well as part-time jobs for those who desire to work while in school. Students in each program are provided with pre-employment preparation instruction. Job placement is a coordinated effort among all staff members. The school contacts employers to assist in graduate placement. The facility also provides an extensive Adult Basic Education program which includes: GED program, reading skills, assistance with speaking English; upgrading math skills, letter writing; learning to help your children with school work; Work Connection Learning Lab. For more information, call 573-346-4260. State Fair Community College and Columbia College provide quality education in a variety of areas. In addition, more than a dozen other colleges and universities are close by and offer a variety of options for furthering education. Students may choose from Central Missouri State University, Warrensburg; Columbia College of Missouri, Stephens College, and University of Missouri, Columbia; Southwest Baptist University, Bolivar; William Woods University and Westminster College, Fulton; University of Missouri, Rolla; College of the Ozarks, Point Lookout; Baptist Bible College, Southwest Missouri State University, Drury College, and Evangel College, Springfield; Lincoln University, Jefferson City; Central Methodist College, Fayette. The Morgan County R-11 School District covers 208 square miles on the north side of the Lake of the Ozarks, and includes the cities of Versailles, Laurie, and Gravois Mills, with a student population of approximately 1600. The Morgan County R-11 school district is classified as Accredited, under the Missouri School Improvement Program. Questions about the Morgan County school system can be answered at 573-378-4231. The R-11 School District includes a pre-kindergarten through 3rd grade elementary school, a pre-kindergarten through 5th grade elementary school, a 6th through 8th grade middle-school, and 9th through 12th, (freshman through senior) high-school. The R-11 District also provides a "Parent-As-Teachers" program, an Early Childhood Special Education program, a Title-1 Pre-school program, and a Reading Recovery program. The 6th through 8th grade middle-school includes electives in foreign language, computers, art, industrial technology, and music. The 9th through 12th grade high school is designated an A+ school. R-11 students who have met the A+ criteria 3 years consecutively, are eligible to receive reimbursement of tuition, fees, and books, while attending a Missouri community college, vocational school, or technical school, as a full-time student, as long as state funding is continued. An A+ tutoring program allows high school students to tutor elementary school students who need individual help. The high school also provides a variety of "dual enrollment" classes, where students can earn high school and college credits simultaneously. The dual enrollment classes are offered through State Fair Community College in Sedalia, Missouri Baptist College, and the University of Central Missouri in Warrensburg. The Morgan County Library moved to its new location at 600 N. Hunter in 2006, and has a "Hot Spot" for wireless internet connection. The hours are 9:00 AM to 5:30 PM, Monday through Friday, and 9:00 AM to 12:00 noon Saturday. You can call the library at 573-378-5319.